The video below is from an interview on Channel 9's Today Extra. 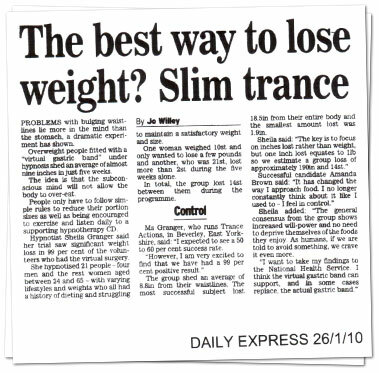 Sheila Granger's Virtual Gastric Band has recently attracted a tremendous amount of media attention worldwide. The video below is a recent report regarding Sheila Granger's Virtual Gastric Band that appeared on the BBC. Disclaimer: Weight loss results vary from person to person. This website is not intended as a substitute for the medical advice of physicians. The reader should regularly consult a physician in matters relating to his/her health and particularly with respect to any symptoms that may require diagnosis or medical attention. The content on this website is for informational purposes only. Hypnotic Weightloss Copyright © 2017 All Rights Reserved.